I've never shared a recipe before on this blog, but today I thought I'd share a quick holiday recipe that was a childhood favourite for me! 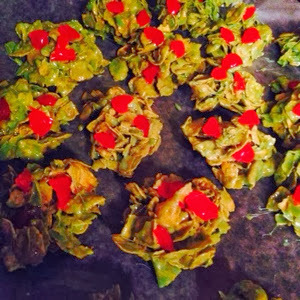 Mom always shaped these into wreath shapes, but as I made these I realized that might take more patience than I have when I'm 'baking' late at night ;) So since these babies are green and decidedly more blob like than wreath like, I'm gonna rename them Grinch Treats this year! The recipe is basically a Rice Krispie Treat recipe with Corn flakes instead of Rice Krispies. Don't add all the cereal at once though so you can make sure the green marshmallow goodness covers them all up! Simple steps: Melt together butter & mini marshmallows in a saucepan at a low temperature. Add almond extract and food colouring until you get the desired shade of green. Stir in corn flakes gradually to mix in colour. Drop by generous spoonfuls onto a cookie sheet lined with wax paper. Add a few bits of cherry to each cookie and refrigerate to set. 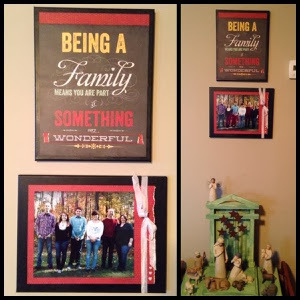 Here's a look at some handmade art I made to hang in the house to celebrate my new family- my awesome husband and four step-kids :) I made this pair of canvases with my mom when she was here visiting a couple weeks ago. 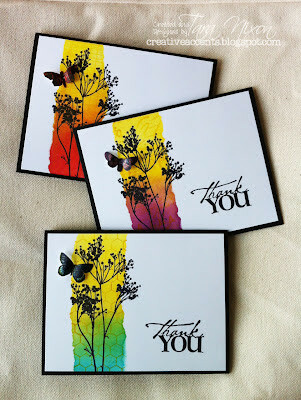 We painted two 11x14 canvases black and did some simple layering with this paper Mom picked up by Reminisce. The quote was on one side and the red pattern on the other. We kept it pretty simple to showcase a family photo!